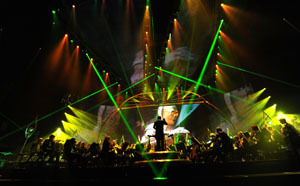 Narrated live by Anthony Daniels (the actor who portrayed C-3PO in all six films), the production features the Royal Philharmonic Concert Orchestra, and a choir, accompanied by specially edited footage from the films displayed on a three-storey-tall, high-definition LED super-screen – one of the largest ever put on tour. 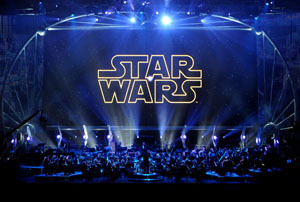 The live music and film elements are synchronized in order to create a full multimedia, one-of-kind Star Wars experience. Full costumes for Jedi Masters Kit Fisto and Plo Koon will be on display. For the first time ever, pages from John Williams’ original hand-written sheet music for Star Wars: Episode I The Phantom Menace will be exhibited for the public. For more information, please visit www.StarWarsInConcert.com.